It is over two hundred years since the last king of Poland was unceremoniously booted from power with Russian connivance, but the cathedral at Wawel remains amongst the most sacred and revered places in the land. And although it is not awe-inspiring in the sense of the vastness of a place like Notre Dame, this mysterious Gothic interior, with its splendid tombs and sarcophagi, still weaves a powerful spell. Certainly, to go down on one's knee and pledge a lifetimes allegiance seems a wholly reasonable idea when faced with a sculpture as beautiful as that of Queen Jadwiga Jagiellon. 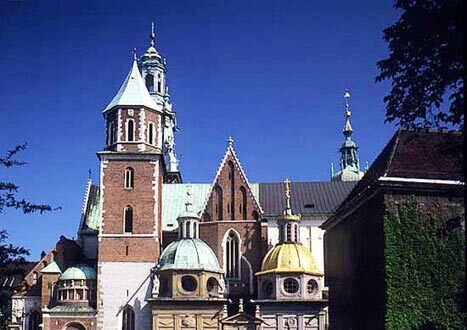 Kings have always been fond of creating myths, and at Wawel they burnished those of both themselves and their saints. By investing their domains with a knights-of-the-round-table spirit, they struck a beguiling, romantic chord that often captured the hearts of their people. Whilst not all of Poland's monarchs lived up to this Arthurian ideal and several, such as the corpulent Augustus II, must surely take their place in the eccentric rulers hall of fame, the cathedral remains a powerful symbol of the country's history. Some fascinating characters are buried in the crypts - kings and heroes both - whilst above one finds some of the most beautiful sacral art in the country. Such a rich concentration of history is rare. The cathedral is in fact the third to be built on this site. It was raised by King Kazimierz the Great in 1320, and his initial, K, swirls in patterns across the doorway. The main body of the basilica was completed by 1364, but chapels continued to be added down the centuries. As late as the nineteenth century powerful aristocratic families were still vying to have chapels built here. However, the two jewels in the crown are certainly the Holy Cross and the Zygmunt, which were built centuries earlier during Poland�s golden age. These chapels, and the tombs that adorn the nave, are a good starting point in any tour of the building. Immediately as you enter the basilica you are struck by the dazzling tomb of St. Stanislas. It dominates the building - and intentionally so. In 1320 the cathedral was dedicated to that saint, alongside Wenceslas, the patron of the earlier foundation. The tomb of Stanislas, which lies right at the centre of the building, has stood on this point since the thirteenth century - kings were crowned at its foot. Everything about this design is aimed to inspire the pilgrim, and they came here in the thousands. A silver coffin (1671), held up by four silver angels and decorated with exquisite reliefs of the saint�s life, proclaims his miraculous power, whilst the whole structure is given focus by the framing of a canopy. Following the aisle clockwise from the entrance, you will first pass the chapel of Queen Sofia. Its kaleidoscope-like stained glass windows cast a mystical orange glow, whilst above there are some lively murals on the ceiling. The next chapel belongs to the Czartoryski family, a genuinely distinguished clan, who were very influential during the eighteenth and nineteenth centuries. The chapel was won by the Czartoryskis fairly late in the day, during the nineteenth century. There is an elegant bust of Prince Ladislas (1828-94), who brought the patriotic Czartoryski Museum to Cracow in 1876. Through a door on your right you can enter the crypts. Back in the main body of the cathedral you will see on your right the brown marble tomb of King Wladyslaw Warnenczyck (r.1434-1444). His effigy is very much that of the Christian knight. At his feet, which are interesting in themselves with regard to medieval footwear, there is a beautifully sculpted lion cub. Continuing along the aisle you will pass the chapel of Bishop Maciejowski (currently closed for renovation) and the typically baroque Lipski chapel. To the right you can enter the detached Crypt of the Bards, where the two great nineteenth century Romantics were laid to rest: Adam Mickiewicz and Juliusz Slowacki. The next chapel, which belongs to the Skotnicki family, is notable for an unusual sculpture of Countess Skotnicki stooped forward in mourning. It is a very beautiful piece. Next along is the chapel of Bishop Zebrzydowski. Emerging from a niche above the altar is a magnificent sculpture of Christ - an absolute paradigm of compassion and grace. In the adjoining room, the Sacristy, one finds the entrance to the famous Zygmunt Tower. Opposite the sacristy is another wonderful tomb. It is hewn from creamy sandstone, and belongs to Wladyslaw the Short (r.1306-33). Looking up, you can find some delightful details, above all the loyal knights that stand guard at each corner of the canopy. Arriving at the eastern corner of the cathedral you face the chapel of Bishop Gamrat. It has a pretty ceiling that looks as if it has been carved from coral. To the right is the magnificent Chapel of Our Lady. Full of black marble and dark wooden furnishings, one can imagine some Italian grande dame sitting here in her mourning clothes. The tomb, which is one of the finest in the cathedral, was designed by the brilliant Italian architect, Santi Gucci, for King Stefan Batory (r. 1576-86). The vaulted ceiling has some beautiful frescoes, now very much faded. Opposite (behind the main cathedral altar) are two black marble memorials, the first to King Michal Wisniowiecki (1669-73) and the latter to King Jan Sobieski (1674-96). The latter includes two dastardly Turks with their hands bound, thus symbolising the King's historic relief of Vienna from Kara Mustafa in 1683. Next to the ponderous Chapel of our Lady one finds a contrastingly light and airy enclave. This chapel is dedicated to the great renaissance patron of the arts, Bishop Piotr Tomicki. Turning now back down towards the western end of the cathedral, you will find on your right the Gothic tomb of King Kazimierz the Great (1333-70). He united the kingdom and strengthened it immeasurably. At the same time he transformed its physical aspect, fortifying many towns and building numerous castles. The old dictum goes that he found a country of wood and left one of stone. On your left you will pass the chapels of Bishop Zaluski, a typical baroque design, Jan Olbracht, which is more restrained, Bishop Zadzik, baroque, and Bishop Konarski. The latter can be recognized by the large Polish eagle that is emblazoned on the mauve window. The next enclave is the famous Zygmunt Chapel, hailed as the most perfect Renaissance building north of the Alps. It is currently undergoing a major restoration. Opposite this chapel one finds one of the most exquisite tombs in the building. It belongs to Queen Jadwiga Jagiello (1374-99) who was also made a saint in 1987. This tomb was commissioned one hundred years ago by a wealthy aristocratic family, the Lanckoronskis. The queen is fashioned from cool white marble, and she lies with her hands joined in prayer. It is an incredibly delicate work, with many charming details, such as the contented looking dog at her feet. As has been pointed out, technically the Queen faces the wrong way. No medieval bishop would have omitted to stress that the feet must point towards the altar,- the fountain of grace. The next chapel, a ponderous black creation, was built for the Vasa family. This was the Swedish dynasty that were called in at the close of the sixteenth century. They reigned for much of the following century, and by then the Polish Commonwealth was in deeply troubled waters. Next along are two chapels belonging to famous aristocratic families, one now extinct, the Szafraniec, the other still very much around (albeit in a less powerful form), the Potockis. Arthur Potocki, who strove for a kingly role in Cracow following the theft of Polish sovereignty, (Cracow remained the last free city in Poland until 1846) made a controversial bid for this chapel during the 1830�s. He was a big patron of the arts, and a forerunner of the conservationists of the latter half of the century. On the right of these chapels you will find the impressive red marble tomb of Wladyslaw Jagiello (1386-1434). It is well worth a good look. The king has been magnificently rendered, and a Chinese-like dragon lies pronged at his feet. The final chapel, and an absolute star, is the Holy Cross, which was the focus of a Tutankhamen-like incident during the 1970s. If you have not already sat down by this point, then perhaps now is a good time to retire to the wooden choir stalls. Here, in front of the altarpiece, you can contemplate the divine mysteries and reflect on what you might like to eat for lunch. One would certainly need to be a hunchback, preferably brandishing a flaming torch and with a wild, roving eye, to make it up here without a little discomfort. But once at the top you will find an expansive view of Cracow - not the best in the city but worth it all the same. Above hangs the mighty Zygmunt Bell, which was named after King Zygmunt the Old. Cast in 1520 and some eleven tonnes in weight, its toll can be heard 50 miles away. In a city that has an abundance of churches, and with them bells, this one wins hands down on all scores. It is a beautiful, sonorous noise, worthy of the venerable cathedral it peals from. The fact that it can only be heard a few times a year, on religious festivals and the like, no doubt adds to its mystique. By touching the bells clapper, those of a noble disposition are said to be blessed with good luck. Hallowed indeed are the crypts that lie beneath Wawel. And it is not just kings that make it so. Many of Poland's finest sons are to be found there. Indeed, if one was to ask a Pole to name five of the most mythic characters in his country's history, it is likely that all are buried at Wawel. It is the highest honour that the country can bestow, and it has been a place of pilgrimage for many centuries. So there is to be no snickering at the back children, or ice cream is most assuredly off the menu. It is natural that the endless run of unpronounceable names ending in '-ski' may be a bit bewildering to the casual visitor. After all, none of these figures are given much coverage in Western schools and universities. This is a shame though, as some fascinating tales lie behind these characters. The first room that you enter really is a pantheon. It is in fact the only surviving relic of the earlier Romanesque cathedral of St. Leonard, dating back to 1120. Pope John Paul II said his first mass here in 1946, a private tribute to his parents. In this vaulted chamber one finds Tadeusz Kosciuszko (1746-1816), the hero of Poland's fight to maintain independence, and his contemporary, Marshal Jozef Poniatowski, nephew of the last king and a hero of the Napoleonic Wars. 'God, Honour... Poland' were said to be his last words as he was swallowed up by the River Elbe at Leipzig in 1813. Other military characters of equally heroic stature are King Jan Sobieski, the 'Hammer of the Turks', who commanded the historic relief of Vienna in 1683. He is one of Poland's most romanticized kings, and was a flamboyant, chivalrous character. There is also a very recent addition amongst these venerable figures. This is the tomb of Ladislas Sikorski, Poland's wartime leader. Like Poniatowski years before him, he died tragically, when his plane crashed into the sea whilst returning from a reconnaissance trip to Gibraltar. It was not until 1993, after the fall of communism, that his coffin was returned to Poland. Turning left you can walk through a chain of further crypts, where scions of the Jagiellon, Vasa and Saxon dynasties are to be found. The tour ends with a room devoted to Marshal Pilsudski, the hero of Poland's rebirth in the wake of World War I.
if yr every visited the great castle of poland see if y can fine my family name in the crypt an Wawel castle or Malbork castle too a let us know! My grandpa was Arthur maybe a Kings man he was shot in the head but survived. I'm not sure if they thought he died but he did not. My mother is Moira Elizabeth Criswell/Marshall and I am not sure but some reason I feel like I had family somewhere else but I am not for sure. "merry cristmas an happy newyears 2013 to all my family in poland ,a many friends there toooxoxox god bless you all. Visited Krakow for the first time - absolutely love Wawel Cathedral. Will definitely be back. The history that this place contains is amazing and I would recommend to anyone. The last time we were in WAWEL was the summer of 1984 during Marshal Law. The people of KRAKOW and indeed of all of Poland proved to us and to the world what a class act they were and still are. We hope to return in 2011 and can't wait to see all the changes. If I were a composer I would write a song beginning with the words, "Were I to be born again, it should be in wonderful Krakow!" There is nothing as awe-inspiring as Krakow with its royal castle. The people are the most honest in the western world! What a wonderful vacation. it was very interesting much better that my vacation to Fl keys but we get to stay longer 4or 5 months.Well maybe in my next life I will get there. LOL Thanks for sharing you trip,very interesting and funny too!